December is going to be a very busy time for zero waste and climate justice groups who will be meeting in Paris. In the context of the Paris COP21 climate talks taking place during the first few weeks of December, Zero Waste Europe has teamed up with Zero Waste France, GAIA (Global Alliance for Incinerator Alternatives) and many other organizations to kick off a great calendar of events to promote zero waste climate solutions and challenge climate finance going to dirty energy from landfills and incinerators. Paris will be a chance to meet community zero waste leaders, visionary zero waste entrepreneurs, front-line impacted communities and cutting-edge researchers that will present and highlight the connections between the management of municipal solid waste (MSW) and climate change, including full presentations of our recently launch report The potential contribution of waste Management to a Low Carbon Economy. Here is a brief run-down of some of the key zero waste and climate events happening in the end of November and beginning of December, and do follow the links for more information about each event. Waste incineration in cement kilns has been lauded by the industry as solution to climate change. This conference will discuss how to thoroughly tackle that assertion, and build connections between community campaigns and groups who are working on this issue around the world. This conference, hosted by local organisations will provide a forum for groups many different countries to meet, share lessons and experiences on organising and campaigning, and discuss the potential for a global campaign on cement kiln waste incineration. The march, taking place the day before world leaders and negotiators arrive in Paris, aims to put pressure on the negotiations to demand a effective collective response to the climate crisis. At the same time as this demonstration in Paris, marches will be taking place around the world, and supporters of climate justice who are not in Paris on the 29th are encouraged to take place in demonstrations wherever they may be. Celebrating the 15th Anniversary of the GAIA (Global Alliance for Incinerator Alternatives) network, this event will bring together the most active members of the GAIA network in Paris to reflect on the history of the network and look towards the future, in terms of strategy, projects, campaigns and structure. This meeting hopes to deepen and strengthen relationships between GAIA members to create a more effective and dynamic network where members can work effectively across borders towards zero waste solutions. Zero Waste France, will be hosting a large conference to emphasise ‘Zero Waste’ as a climate solution. The event will debunk incineration as a climate and renewable energy solution, and work to increase the visibility of existing successful models. Participants include Zero Waste experts, government officials, European NGOs, representatives from Zero Waste projects from the Global South, and GAIA members. This event will take place at the Ecole Nationale Supérieure Amphithéatre Jean Jaurès, Paris. Read the full programme on our event page. At an event inside the COP21 Climate Summit, we will be discussing the waste management strategies which will help lead us towards a low carbon economy, with leading practitioners in the Global South. There will also be a booth inside the event, with the latest publications from the network. Space only open to accredited participants. This event will bring together leading practitioners, cutting-edge researchers, and Global South representatives of local farming and cooperatives of waste pickers to look into the climate solutions around organic waste, particularly exploring the intersection between zero waste and agroecology. In cities around the world, practice is showing that tackling organic waste is key; while being part of the problem, its proper management in composting can turn it into a real solution for soil depletion, emission reduction from landfills and use of chemical fertilizers. Final programme to be announced soon. With a international panel of speakers, this side-event will look at specific NAMAs around the world, including those in the waste sector, with specific attention to the participation of civil society. We will be hosting a side event at the Le Bourget Civil Society Space examining the ways in which Zero Waste solutions can be a vital contribution to the mitigation of climate change. This event will take place in Room 7 at the civil society space. The discussions will include members from waste-pickers organisations and will highlight the role that waste pickers and their organisations can play in mitigating the effects of climate change. A large festival organised by Alternatiba in the Montreuil area of Paris. The event is powered by more than 500 volunteers, and climate enthusiasts from around the world. The temporary village will present the huge variety of alternatives for climate justice, and will include Zero Waste areas. 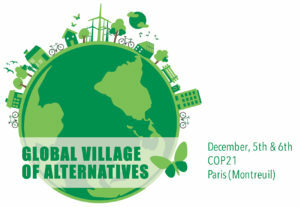 Hundreds of actions, debates and initiatives will be organized by civil society, both French and International, in and around Paris during the whole two weeks of the COP21. But this weekend will see the greatest concentration of debates, workshops, screenings and presentations of concrete alternatives in the face of climate change. This “People’s Climate Summit” will take place in Montreuil, a lively working-class town just outside the East of Paris. The Climate Action Zone organised by Coalition Climat 21, will present the grassroots campaigns working to fight the effects of climate change. We will hold events on zero waste strategies and climate justice from around the world in this space, dates and specific location yet to be confirmed. Over this period there are going to be many more climate actions taking place, and the Zero Waste Europe/GAIA delegation will be coordinating with Zero Waste France & local activists to participate in the mass mobilisation planned for 12 December. With such a busy schedule it is clear Zero Waste solutions will be present in many of the civil society spaces of the COP21 climate summit, and hopefully this opportunity will allow us to build and strengthen our network to tackle waste incineration across the world beyond the conference.